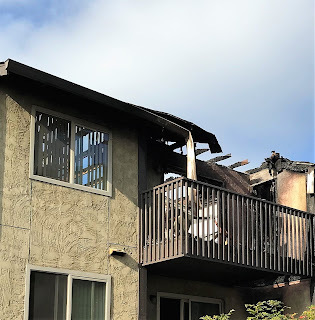 morning fire that occurred last month at the Spanish Hills apartment complex, located at South 12th and Mildred streets. The Oct. 14 blaze caused an estimated $370,000 in damage to a three-story, 12-unit building and displaced 17 tenants. As he arrived home that morning, Mr. Dunn noticed that one of the other buildings in the complex was on fire. As he got closer, he saw flames coming from a top floor balcony and burning material falling onto a balcony below. Mr. Dunn called 911 and made his way up the exterior stairs to the top floor of the burning building. After escorting the first resident to safety, Mr. Dunn started pounding on the locked doors of the other units in the building. The dispatcher prompted him to locate a manual pull station in the stairwell to activate the building’s loud siren to ensure that all the tenants of that building were further alerted to the danger. No smoke alarms had been activated at that point because the fire was burning between the ceiling and the roof and on exterior balconies. The firefighters that first arrived reported heavy smoke and flames. Shortly thereafter, the fire burned through the roof. A total of 34 firefighters from nine fire stations fought the blaze. They had the fire under control after about an hour and prevented it from spreading to the entire building. No injuries were reported.